Using an online legal service like Northwest Registered Agent is a reliable way to form an LLC, and it’s much less expensive than hiring a lawyer. In this review, we’ll go over the details of Northwest's LLC formation service and explain how it compares to other services on the market. Read on to find out if Northwest Registered Agent is the right choice for you. While relatively new to the LLC filing industry, Northwest is one of the largest and most trusted names in the registered agent business. Northwest has built a strong reputation for providing quality services at fair prices to their clients. We were so impressed with Northwest’s filing service that we collaborated with them to develop the most cost-effective business formation packages in the industry. Unmatched Value: Northwest is one of the only companies that bundle one full year of registered agent service with all of their packages at no added cost. Their flexible package offerings and add-on features make it possible for any business to meet its needs at a fair price. Top Notch Support: You can throw just about any complicated or straightforward question related to your LLC at one of Northwest’s experienced support team members. In our experience, they’ll almost always have a solution. Out of all other LLC services we have tested and reviewed, they by far have the best customer support. Privacy: Unlike other LLC filing services, Northwest won’t share your information with third-party advertisers. Also, Northwest lets you use their address in state filings to protect your privacy and prevent unwanted junk mail. Who is Northwest Registered Agent Right For? Northwest provides elite customer service from knowledgeable professionals. Get business attorney level service at a cost any business can afford. Our recommended alternative to Northwest is Incfile. Their packages have more potential features, you can read our full review here. 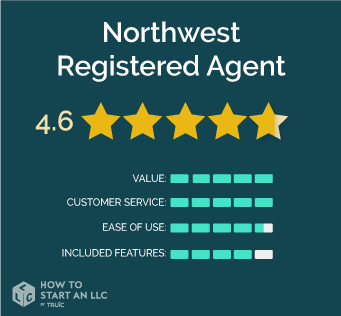 Like most other LLC formation services, Northwest Registered Agent offers three tiers of bundled features tailored to clients with a variety of needs — and they also provide several a la carte features that you can add on. All of their packages include a year of registered agent service and offer options to expedited shipping, where available. Northwest’s Basic package starts at $49 plus your state’s filing fee. When you purchase the basic package, Northwest will verify that your name is available in your state and file the formation documents. Northwest’s Basic package is by far the best option for entrepreneurs who want to save money and are comfortable filing an EIN and creating an Operating Agreement themselves. For $100 more than you’d pay for the Basic package, you can upgrade to Deluxe. The Deluxe plan includes everything from the Basic package and adds an Employer Identification Number (EIN) and an operating agreement. These two items are both necessary items for the vast majority of LLCs. You’ll need an EIN to do things like hire employees or open a business bank account. An operating agreement is a vital document that outlines an LLC's company policies. If you would rather save some money and go with the Basic package, you can obtain an EIN for free through the IRS and use our free tool to draft your operating agreement. Who should purchase the Deluxe plan? The Deluxe plan is perfect for cost-conscious entrepreneurs who would prefer to focus their energy on starting a business, rather than dealing with paperwork. The Premium package adds guaranteed same-day processing to the Deluxe package for an additional $60. Who should purchase the Premium plan? You’ll only need this package if you’re in a rush to get your LLC filed as soon as possible. Even at the Basic and Deluxe levels, Northwest is reasonably quick to turn around your LLC filing. Northwest’s Basic package is among the most affordable options available anywhere for LLC formation. Especially considering it includes a full year of their premium registered agent service. It’s a great deal. Top-notch customer support is Northwest’s calling card. Their employees are highly knowledgeable, and you can even request a preferred support member. That means you can talk to the same person every time you call. Their website isn’t quite as easy to use as some competitors’ sites, but it’s perfectly functional. The order forms and checkout pages are smartly laid out in a way that paints a clear picture of each feature's cost. Their online dashboard, which neatly organizes all of your LLC paperwork, is also convenient. While Northwest does not offer all the extras that some other services include, their packages get you everything you need and nothing you don’t. A key selling point is that they offer a free registered agent for 365 days, which saves you around $100 if you were to use LegalZoom.